This lighthouse, on the small island of Fladda, between the islands of Easdale and Lunga, Argyll, was established in 1860. This was during the time of David and Thomas Stevenson, lighthouse engineers. Scotland's coastal waters were very dangerous to navigate. But the first lighthouse wasn't built until 1636, on the Isle of May in the Firth of Forth. Others soon followed: Buddon Ness (c.1690, rebuilt 1753), Southerness (1748) and Little Cumbrae (1753). A national body was set up in 1786 which subsequently built many more lighthouses around the coasts of Scotland. Cumbrae was converted to automatic working in 1956. 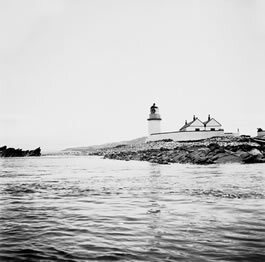 The buildings to the right of the lighthouse had housed keepers.